DL Services Landscaping offers a range of design options from onsite consultations, preliminary sketches to a full design service including site survey, scale plans and planting plans. We provide grounds maintenance services to Housing Estates, Commercial and Private clients. We also provide a maintenance service, hedge trimming, grass cutting and lawn care including feeding and weeding, beds sprayed and weeded. A maintenance contract can be arranged with regular visits to keep your garden looking its best. All garden waste taken away. Full Landscape Plans – Interlocking Driveways & Walkways – Patios – Decks – Fences – Retaining Walls – Tree – Shrub – Perennial Plantings – Night Lighting – Privacy Needs – Irrigation – Water Features – Low Maintenance Landscapes. We have a lot of experience in clearing out old gardens and Redeveloping them into the space that you would like.. We have diggers and 7 tone tipper truck for the removal of waste. 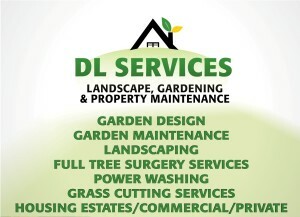 DL SERVICES has been providing power washing to residential and commercial clients since 2009. We use 100% friendly bio-degradable detergents and chemicals, with pressurized water. We have cleaned everything from weathered dirt, built up moss, lichen, paint and chewing gum from paths, patios, and cobbled-stone, etc. We also clean walls, tiled steps, decking, tarmac and concrete. Our experienced garden expert will work with you in choosing the highest quality trees and shrubs to best suit your taste, requirements, needs and budget. All plants sourced from reputable nurseries and suppliers to ensure quality and value for money. All our products come from reputable suppliers. We can transform your tired & weedy lawn into a lush weed free green carpet to be proud of. Options include seeded and turf lawns to best suit your budget and requirements. We also provide a follow up service to ensure your lawn is looking its best throughout the year. We can provide fencing styles to suit your tastes: picket, hit and miss or closed panel. Raised beds from new eco-friendly treated timber. Side gates provided and erected at keen prices.